The word father conjures up different images for everyone. To some it brings the picture of love, laughter, respect, and acceptance. Unfortunately, others associate the term father with fear, rejection, and disappointment. That is why it is so important not to take your understanding of your heavenly Father from your experience. Take it from Scripture. You undoubtedly had an imperfect earthly father, perhaps even one who brought you harm. 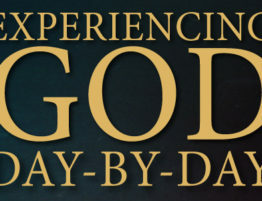 But, as in all of your Christian life, the key is not to understand the Bible based on your experience, but to understand your experience in light of the Bible. God is your model of a father in the truest sense of the word. Your heavenly Father was willing to pay any price in order to save you (Rom. 8:32). Your heavenly Father_is always ready to meet your needs (Luke 11:11-13). Your heavenly Father loves you so much that He is willing to discipline you to bring you to Christian maturity (Prov. 3:11-12; Heb. 12:5-10). Even when you rebel against Him and reject His love, your Father continues to do what is best for you (Rom. 5:8). He does not make His love for you conditional upon your love for Him. He loves you even when you are not loving Him (1 John 4:19). He has made you His heirs and reserves a home for you in heaven (Rom. 8:15-17). This is what a father is like biblically. If this has not been your experience, it can be now. There is One who has adopted you and who wants to love you in a way you have never experienced. Take comfort and strength from Him–your heavenly Father.